couldn’t have made his mother and me any happier. which when combined with ice cream also tastes great on a warm summer night. Anthony Bartol and Jeff See. purchase the terrorism rider. If you paid your dues and did not receive a 2016 membership card, see Dianna. help you find literature with specific projects. the Saturday after the meeting in the craft room at Generations. Wood Requests. 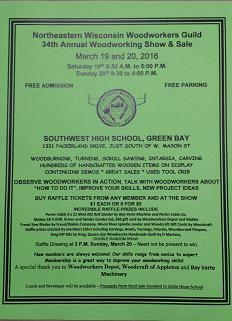 Don Lorier mentioned that if you have a special wood request, see him to order for delivery at the show. Renzelmann. Copies of the project with step-by-step instructions were available at the meeting. The signup sheet was available. Unity Music Festival Tree. A 9-foot tall tree crafted out of rebar by Joanna and Tom Tripp will be trimmed with our woodcarvings. some of the ornaments with a water repellent wood preservative. want to be a judge for the show entries. He is about to contact former judges soon and wanted to give members first chance. sell their work, we would shelve this idea for this year. Gary suggested that members check it out this fall and report back to the club. Duck Decoy Repair. Neil Lorenz had a request to repair a duck decoy. He asked if anyone would take on the project. Figure Wood Carving by Ross Oar. The winner was Jim Rooker. Raffle. Neil Lorenz took home the gouge and Francis Larson's ticket was picked to win the gnome roughout. The meeting was adjourned. Larry Lienau then demonstrated how he completed the heart pendant. March 2 will be taken off the membership list. rosietom@centurytel.net or phone 608-868-4522, www.rockrivervalleycarvers.com. to us for many years. Next meeting: March 2 at Generations in Plymouth, Wisconsin, 6:30 p.m.
happy or unhappy. It is what you think about it.